2. Three youth organizations were founded in 1953. The one commonly called simply Shabab which was the Moslem Youth League. The second one called Partite Giovanile Federalists Eritrea (The Young Federalists) held their first organizational meeting on Dec.26, 1953. According to Killion (1997:50) The Young Federalists had about 60-80 members and their first leaders was Tesfai Redda from Dekemhare, who was repeatedly imprisoned and tortured. Both organizations were composed primarily of young men, representing the new and much more militantly anti-Ethiopian nationalist, generation of Eritreans who came of age after the demise of European colonial rule (Killion 1997:51). By 1958 the Young Federalists were part of a widespread " Federalist-Independence movement" Their ideology had gone beyond the idea of simply preserving Eritrean autonomy to seeing Federation as a " stepping stone" towards independence. (Killion 1997:50). The third youth organization called the Eritrean Youth Peace Council. According to Berketeab(2000:169) an organization called the Eritrean Youth Peace Council emerged, which was an amalgamation of the Youth wing of the Moslem League and the Unionist Party. All the above organizations took an active role in the resistance against the violations of the Federal Constitution between 1952 and1958. For example between 1954 and 1956 sporadic student strikes were common, especially in Asmara. ; in 1958 there was another two-week general strike of workers, students, and self- employed which paralyzed Eritrea . This strike called by the underground Eritrean Labor Union Federation protesting the violations and coercion took place in all major Eritrean cities but it was suppressed by force which caused for the death of 88 demonstrators and 450 wounded, and thousands were jailed. Killion added that the General strike was participated by the workers included the Young Federalists, the Muslim Youth League and the Asmara high school students led by Tuku'e Yehedego ( Killion, 1997: 40). In protesting against this in March and April 1958, eighteen prominent citizens including Omar Kadi (note) were arrested for sending a telegram to the UN Secretary-General protesting against Ethiopian violations of UN Resolution 390A(V). As a result, coercion of the Eritrean people by the Ethiopian government and the four days’ general strike which greatly contributed in raising political awareness that led to the rebirth of Eritrean nationalism.In the late 1950s the Eritrean people began to search for an alternative way to challenge the Ethiopian policy of coercion. This generated Christian-Moslem co-operation, leading to the emergency of a "modern nationalist underground political movement led by the Eritrean Liberation Movement (ELM ) Bereketeab(2000:170). Based on this policy in 1959, the ELM sent Tahir Ibrahim to contact them but he was met with suspicion verging on hostility, except Wolde Abe Wolde Mariam, who later agreed to become the movement’s representative in Egypt (Markakis 1987:107). In connection with this, Killion (1998:433) wrote that the sectarian politics of most of the Muslim exile community in Cairo left Woldeab isolated until 1959. 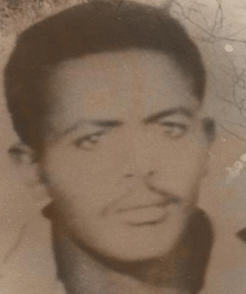 With the rise of the secular Eritrean Liberation Movement ( ELM) whose labour-oriented political programme coincided with Woldeab as own political vision, he returned to political activity serving as the ELM's Cairo representative.